I have a lot of car buddies, but the most obsessive car guy I know other than myself Is Dale Jolly. We've been friends since my college days and while I have mostly limited my car fetish to small scaled wheels, Dale has always played with the big stuff. He's had an interesting career including stints at Bobby Rahal's Indy Car Team and TrueChoice Racing. Currently, he runs Mnich Automotive in Columbus, Ohio which services and sells specialty & performance cars. He's also had a number of his own really cool cars over the years including; a Lotus Esprit, a Buick Grand National, a small block 350 powered S-10, and a slew of Mopar muscle cars among them. I've vicariously lived out my real car fantasies through Dale. As Dale approached his 40th birthday, I wanted to build a model for him as a gift. At one of his famous Daytona 500 parties we were looking through scrap books of the rides he's had and I asked him which of his cars had been his favorite. 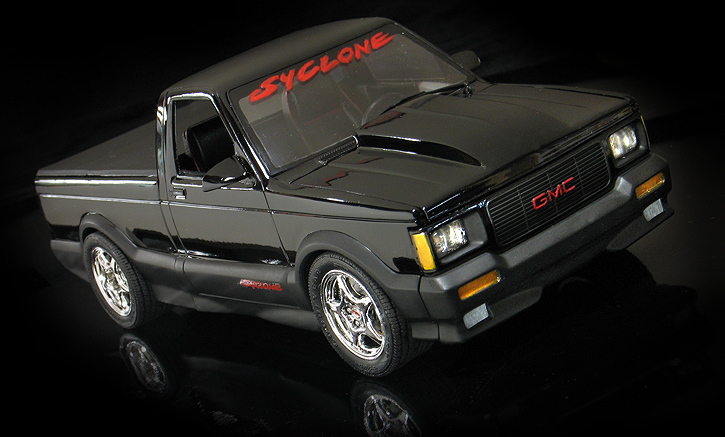 He said his GMG Syclone pickup was one of the most fun cars he's ever owned. So, I decided that would be the one I would build for him. 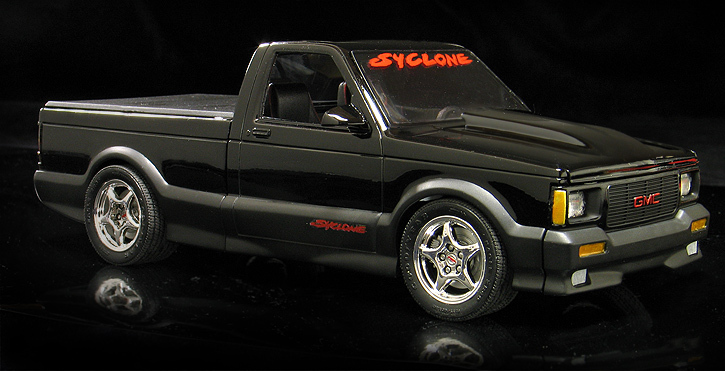 Under false pretences I got him to email me some pics of his truck to use for reference and then starting building. 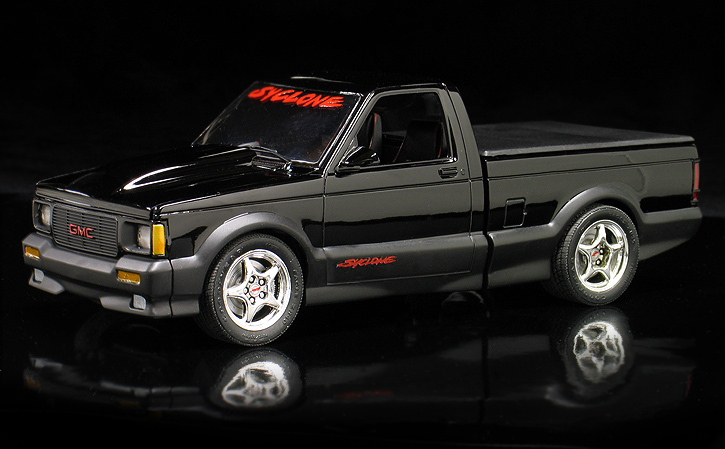 The replica was built using the Revell 1/25th scale GMC Syclone kit which was first issued when the real truck was new back in the '90's. 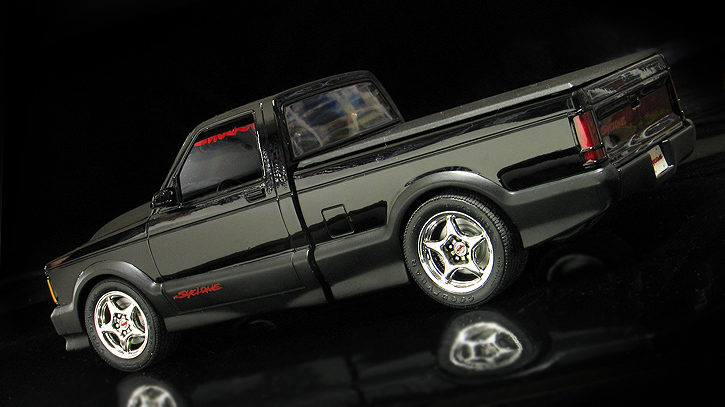 The most noticeable mods Dale did to his truck included adding chrome replica Corvette ZR-1 wheels, a lowered suspension and a fiberglass cowl induction hood. To get the right rolling stock I bought a Revell '95 Corvette ZR-1 kit off ebay to rob for parts. Dale also had Corvette side mirrors on his truck so the Corvette kit gave those up as well as it's upgraded brakes. To make the cowl induction hood I took the Z-28 hood from a AMT '69 Camaro Funny Hugger kit, cut the scoop out, shortened it and then blended it to the Syclone hood with Bondo. The rest of the kit was built pretty much right from the box. 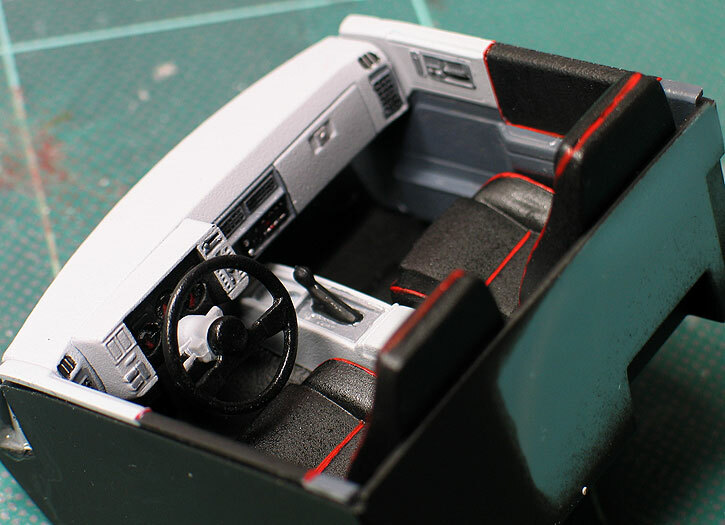 The interior was painted in multiple shades of gray and black to match photos I had. 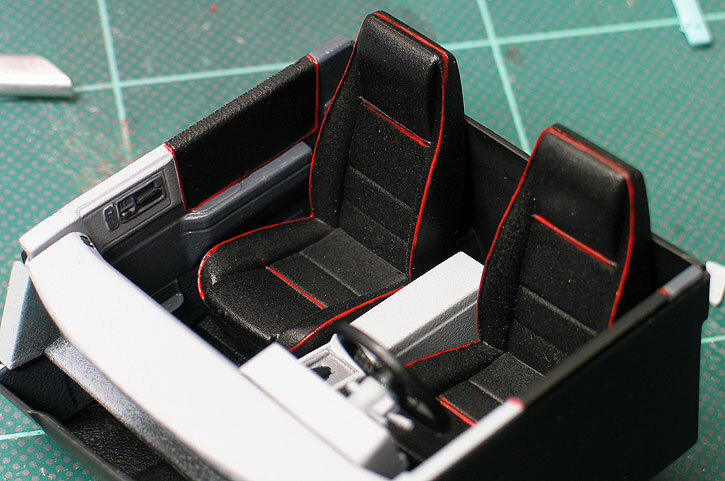 I also hand painted all the red piping on the seats. My hands aren't as steady as they use to be but I was happy with how it turned out. 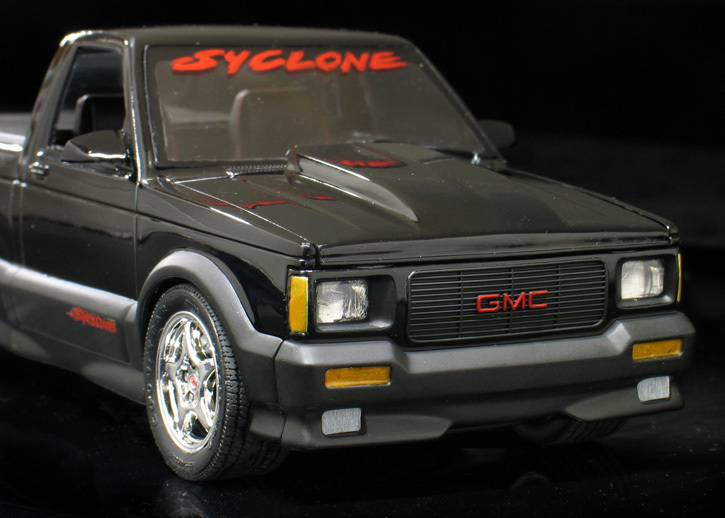 The paint I used for the body was Tamiya gloss black and Krylon flat black for the aero kit. I got lucky and got a nice smooth paint job on the first try so no additional polishing was needed. 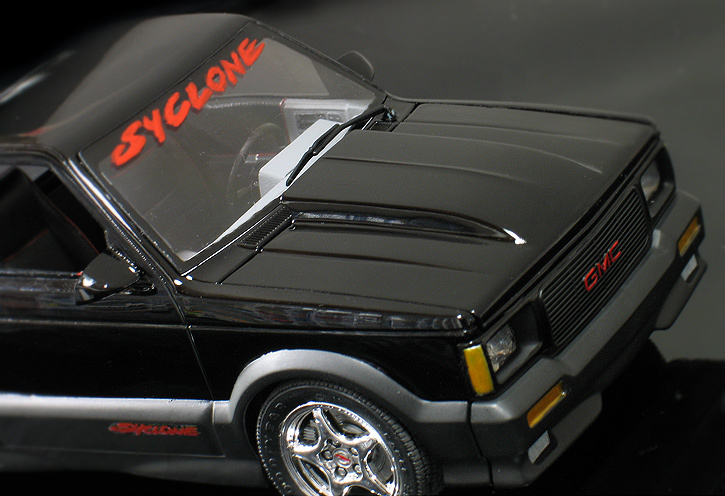 The Syclone windshield banner was painted by hand. 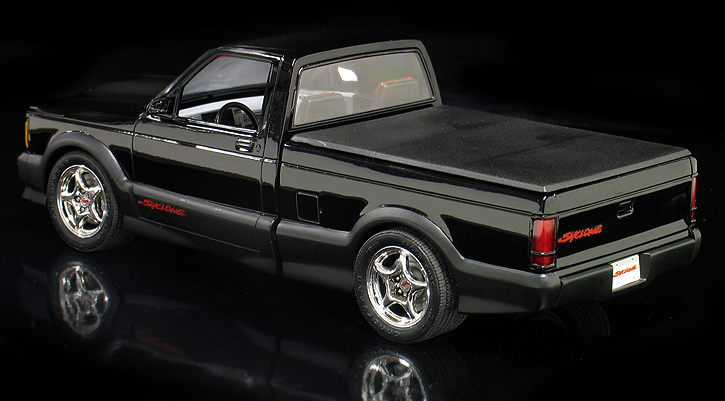 I had previous built one of these Revell S-series kits to make a replica of my own S-10 pickup. I had forgotten how nicely detailed these kits are. I had also forgotten how fiddle-ly though they can be to assemble. The interior bucket is a little too deep which causes the front of the chassis to sit "nose up". It required a far amount of last minute grinding on the chassis with a Dremel tool to get it all to fit properly. I also lowered the suspension mounts considerably to get the truck to sit with a lowered look to match the photos of Dale's truck. Here's a photo of Dale's real truck. 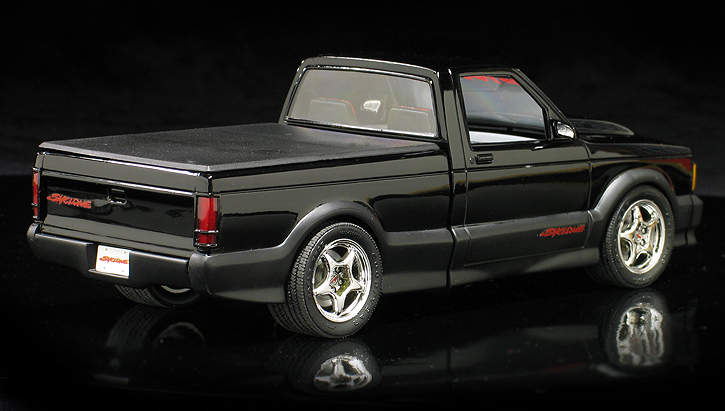 It was a neat truck, but Dale wanted to move on and the truck eventually found a new home to make way for a red '96 Viper coupe.